When we moved to Cedar City in January, we put Ashlee in a gymnastics program here. She has absoulutely loved it! The facility is really nice. They actually have class in the same gym that the SUU gymnastics team trains in. When Ashlee started she was really shy and pretty uncoordinated. But in just a few months she has really caught on and done well. Wednesday was her last day of class for the summer so I got to take a couple of pictures. We were pretty sad though because her teacher wasn't there on the last day. So I didn't get a picture with Ashlee and her teacher. On the 16th Nate and I celebrated our 5th anniversary. It was great to actually be together this year. We have had very interesting anniversaries. Our first anniversary, we had to bring Ashlee along because she was just a few weeks old. Our second anniversary, Nate was really sick and we did nothing. 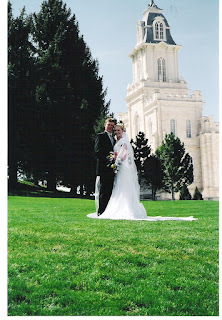 Our third anniversary, I was in Ephraim and Nate was in Ohio. Our fourth anniversary Nate was in Miami and I was in Ephraim. So, needless to say it was great to be together. We sent the girls to Ephraim with Grandma and Grandpa and got to really enjoy the weekend kid free. We went to Zions for the weekend. It was beautiful. The weather was perfect and the scenery was amazing! We got to go hiking and just relax. It was great. I loved being able to spend time together with no distractions. 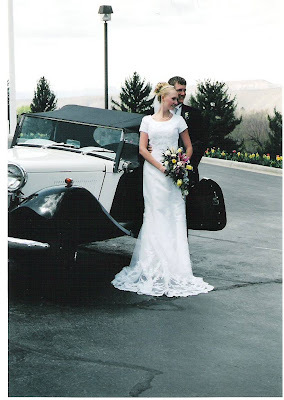 It is so fun to look back at our wedding pictures and remember that day and all that we have been through over the years. I love seeing how much our realationship and our love has grown and become stronger as our family had grown. Easter was so much fun this year. We had a great time in Ephraim with my family. We dyed easter eggs, went bowling, had an easter egg hunt, and the Easter Bunny even paid us a visit! The girls had a great time playing with all their cousins and grandma and grandpa. We had an easter egg hunt at my mom's house for all the grandkids. We did the three toddlers (18 months) first by themselves then the older kids had their hunt. On the hunt for easter eggs! Taylor didn't really get the idea of the easter egg hunt. She kept putting eggs in the other kids baskets. Joshua kept taking the eggs out of the other's baskets, and Kiana just wanted to open them and eat the candy inside instead of picking up more eggs. The older kids had a great time. We hid the eggs so well that at the end there were a couple of eggs that we adults couldn't find. Taylor eating the candy (wrapper and all) from the hunt. Ashlee got a necklace and rings in her eggs at the hunt. While we were bowling Saturday night, the Easter Bunny stopped by grandma's house and hid our Easter baskets. The kids loved looking for them. Ashlee's was in the dryer and Taylor's was behind the end table. As the kids were looking for their baskets, we were trying to help Taylor find hers. We were trying to get her to look under the table, so I tossed a candy wrapper under the table. She immediately went and picked up the candy wrapper that was right next to the basket and brought it back to me. She didn't even notice or pay attention to the basket. I guess she isn't quite old enough to get the idea.